October 23, 2014 by Ken Ward Jr.
A new West Virginia University study has found that dust from mountaintop removal coal-mining operations promotes the growth of lung cancer tumors. 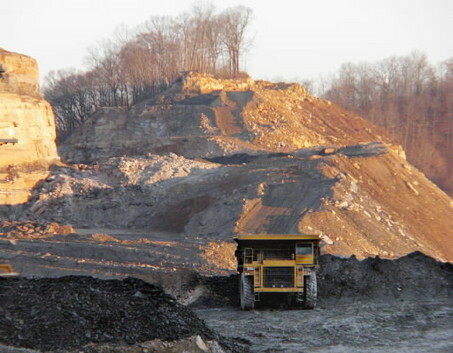 The study results “provide new evidence for the carcinogenic potential” of mountaintop removal dust emissions and “support further risk assessment and implementation of exposure control” for that dust, according to the paper, published online Tuesday by the journal Environmental Science and Technology. It would be one thing if — as some political leaders continually try to suggest — this was just one isolated study. But it’s not. It’s a growing body of studies that continues to present a compelling case that something is going on. And, of course, while the human health studies are the most troubling, the evidence of environmental destruction from mountaintop removal also continues to grow. Mountaintop removal is having frequently overlooked impacts on forests, biodiversity, climate and public health, and an updated federal review is needed to more fully examine those issues, according to a new study by government and university scientists. The study warns that mountaintop removal is not only causing significant changes in the Appalachian topography, but also could be worsening the impacts of global warming. Authors of the study, published in the peer-reviewed journal BioScience, say that legal and regulatory focus on water quality impacts has led to less research on how mountaintop removal affects forests, soils, biodiversity and the mountains themselves. “Evaluation of terrestrial impacts is needed to complement the growing literature on aquatic impacts in order for an environmental assessment of the practice to be comprehensive,” states the paper, written by scientists from the U.S. Environmental Protection Agency, the U.S. Geological Survey, Rider University and West Virginia University. Overall, the data show that mitigation efforts being implemented in southern Appalachia for coal mining are not meeting the objectives of the Clean Water Act to replace lost or degraded streams ecosystems and their functions … and looking forward there is no reason to believe this will change unless new mitigation requirements and scientifically rigorous assessments are put in place. This study ads to the vast body of scientific literature demonstrating that mountaintop removal coal mining is extremely dangerous for both humans and wildlife.. Just last week, we learned about new findings that mountaintop removal mine dust has links to lung cancer; now we are finding that its consequences for Appalachian wildlife are equally dire. We have clear scientific evidence that mountaintop removal coal mining jeopardizes the health of coalfield residents, and today’s study is more proof that we can no longer ignore the dangerous impact of this destructive practice … No one should have to breathe the dirty air or drink the polluted water in mountaintop removal communities, but as long as we allow this public health hazard to continue, we are forcing the residents of Appalachia to do exactly that. Of course, Yarmuth is one of the co-sponsors of the Appalachian Community Health Emergency Act, which aims to require more evidence about mountaintop removal’s health impacts before mining permits are issued. This legislation has hardly been mentioned during political campaigns in West Virginia. We saw what happens when you try to ask Democratic Senate candidate Natalie Tennant if she would sponsor the bill. The findings fit into a larger, hazardous picture: People living near these sites experience higher rates of cancer and birth defects. You don’t see much coverage of these important scientific studies in the West Virginia media, and you don’t see many editorials like the Post’s in our state’s newspapers. I really do wonder why the US Army Corps of Engineers is rarely, if ever, mentioned in news articles. It is their permitting program under the Clean Water Act Section 404 that allows mining companies to build hollow fills in stream valleys, thereby permanently destroying any aquatic habitat under them. Sure the EPA has oversight and often has to push the Corps towards upholding their own regulations…I know this since I was charged with doing it for over 4 years in Kentucky and Tennessee. We did our best to engage the KDMP/OSM, the Corps, and other agencies toward tightening up those permits and providing actual compensatory mitigation for lost streams and wetlands. Much to our chagrin, changing the course of industry to conform to actual permit and mitigation requirements has proved challenging. Either way the Corps has the authority and relegates the permitting program and since they are THE agency that issues the permits I would think they would get more of a mention in the news. Is this because the industry has enjoyed a favorable relationship with the Corps for decades and EPA is seen as outsiders in an area that wishes they would just go away? I am sure the high visibility court cases (Mingo-Logan/Spruce mine) do not put a favorable light on the agency either but these types of cases come about as a result of the Corps giving the industry a pass for so long when it comes to CWA regulations. Maybe its because the EPA has science rather than just empty rhetoric on its side and many folks in Appalachia are distrustful of academics and scientists? I guess its just easier to pick on the EPA than any other agency. All I know is that we are trying to do the right thing and live up to our name: Environmental Protection. We do consider the human element all the time but there are dozens of organizations looking out for the people and industry and so very few looking out for the salamanders and clean water/air. And that’s just stories in the last couple of months. Long linked to underground coal mining, black-lung disease also strikes miners who work above ground – hitting hardest in the Kentucky region. Those are the findings of a new report by the U.S. Centers for Disease Control and Prevention, the first assessment in a decade of black-lung disease in surface miners. It found that 46 of 2,257 surface miners tested during 2010-11 had black lung, meaning roughly 2 percent had the potentially deadly respiratory condition caused by inhaling coal dust. Twelve had the most severe form, and the majority never worked underground. . I stand corrected and will dig deeper. Thanks Ken for keeping the bar high on this blog. I may have been alluding to the lack of mention from politicians, some who promote and even celebrate their disdain for the EPA and science.